Header Photo: ACA Canoe and the Sebago Cup from Bonnie K.
In the Wild, Wild West ethics of the bloggosphere, if you see a photo from another blogger, go ahead and lift it for your own blog. And, that's just what I did. The previous header photo was by Bonnie K over at Frogma, a photo-blogger that covers all things NYC including the goings on at her beloved Watersports club, the Sebago Canoe Club. The photo is of the Sebago Cup, a somewhat long-distance jaunt for small sailboats, held mid-September that takes the fleet around Jamaica Bay. I think Bonnie K. took this photo looking aft while racing her Sunfish. The ACA (American Canoe Association one-design lateen rig) sailing canoe astern is Jim Luton, someone I crossed paths with when I was sailing International Canoes. He was a prolific tinkerer and a boat builder, who somehow got diverted from the open sailing canoes and now, it appears, is back. At the turn of the century I was the American Canoe Association Sailing Chairman for two years and attended the open sailing Canoe National Championships and so have a warm affection for this small band of sailing enthusiasts. Over the years I've owned two ACA sailing canoe hulls that never made it through as complete projects and now have been moved on to other owners. The Sebago Canoe Club and the ACA open sailing canoes are worthy of future posts but you can view some photos of ACA canoes sailing at MASCF that I have previously posted. 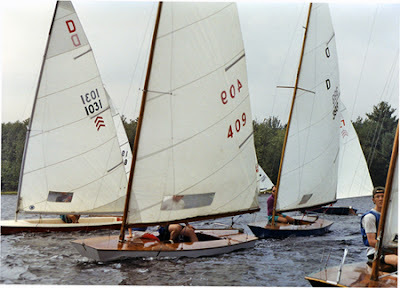 It doesn't take long when perusing this blog to catch on that the blogmeister sails a Classic Moth and that he also tends to feature those regattas that highlight the diversity and/or the history of dinghy sailing. Click on the following Earwigoagin links for regattas like the WOOD regatta, CBMM's Small Boat Festival, the Archipelago Rally, and the Bosham SC Classic Revival - UK. South Gippsland YC, southeast of Melbourne, held probably the first Australian Regatta featuring the great Australian wooden dinghies from yore. Here (was) a great video - Oops! I guess this longish video was a pre-production version, not meant for general viewing on the Net-Toobs and has now been taken down. Not to worry. There is a very good slide show of the regatta and also a video short of the GoPro view of father/daughter sailing on the double plank VeeJay.. Some class logos I recognize; JB for the Uffa Fox 19' Jollyboat, the Circle R of the Rainbow scow, also there is the M logo on the red sails of the regular Mirror dinghy as well as M logo with the halo of the Mirror Miracle, the Bell of the GP 14, the Heron of the Heron class, the red ball of the Fireball, the Butterfly logo of the Moth and the three bars of the Contender class. I've also been promised some pics from the regatta which I'll post when I receive them. Quadcopter - Drone - whatever you want to call it - it's still cool to watch sailing videos taken from up high. A winter sailing series race start from Lymington Town Sailing Club with the typical melange of English sailing dinghies reaching out towards the Solent. LTSC Winter Dinghy Series 2014 from Group LPB on Vimeo. My wife wonders what I do on the computer all the time. Some of it is finding a cutesy but well done video that I can bookmark for today. This one tells the shopworn story of a true love connection that keeps missing despite great effort (but misguided) by the protagonist (until the end - isn't that the way it always works out in the movies). It's an old story but this video does it with some incredible animation. Nothing Says I Love you like a Ham! Banque Populaire - 26 Jan 2014 from Valencia Sailing on Vimeo. Anyone who races a tippy singlehanded dinghy has been in this situation, standing on a completely overturned hull, yanking on the daggerboard. It is a slow, slow recovery, sometimes ending with you riding the daggerboard underwater and righting the boat again. Turtling is generally not conducive to a high finishing position. 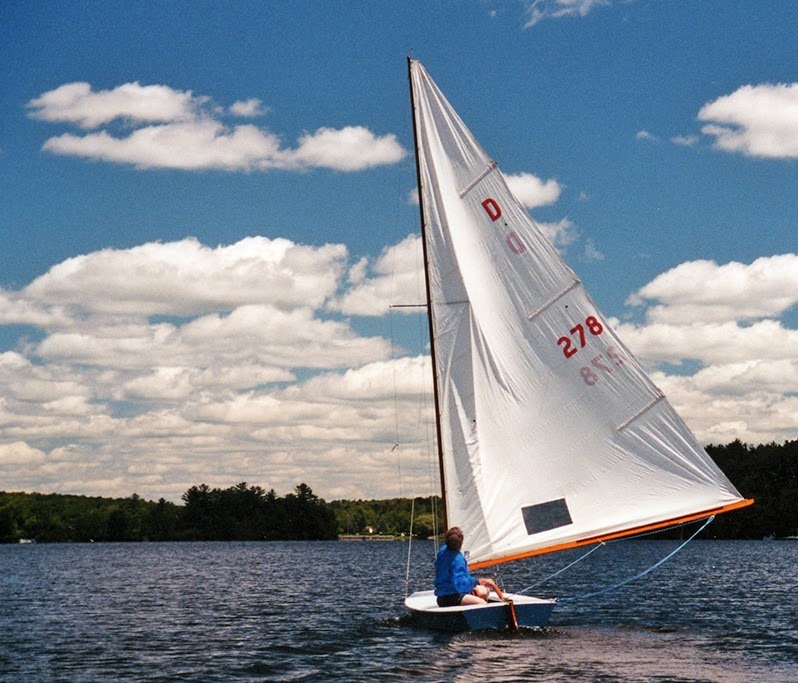 The 12' Butterfly is arguably America's most popular scow with it's greatest numbers found in and around Michigan (though there are fleets in Denver, Colorado and Dallas, Texas). My good friend Len Dolhert, who has raced an assortment of high performance craft, races a Butterly in Denver and says they are "very simple and very tactical". He enjoys racing them. Master Laser sailor and blogger Doug Peckover was the 2013 Butterfly Singlehanded Champion and, as always, completely dissects the racing in this post. Butterfly racers seem to span the ages from the very young to the very old and everyone in between. Here is a testimonial YouTube on the Butterfly from some of the Dallas Fleet members. Oops! My rudder broke off and I'm only 300 km. from shore! Black Cat tell their story. from Steve Searle on Vimeo. 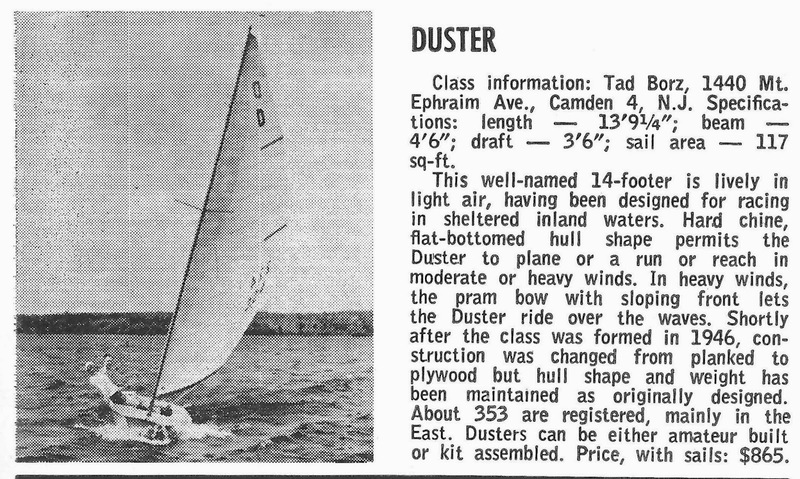 In continuing my series on U.S racing/home-built dinghies that were featured in the January issue of the One-Design and Offshore Yachtsman during the 1960's, this post features the 14' Duster, a class originating out of the Riverton Yacht Club, just outside Philadelphia on the Delaware River. A flat-bottom, pram bow dinghy designed to be home built, originally planked and then converted to plywood, the Duster spread throughout New Jersey. It sported a large cat rig, the mainsail even larger than the main on the Finn dinghy. 1933 First Duster Class boat build on third floor of 301 Main street by Jim Merrill and his father Commodore E.K. Merrill. The project was financed by the club, and the Duster could be rented by the hour. John Ayers built the next Duster "Zypher" under the direction of Mr. Merrill. Jim Story and Charlie Knight built "Quacker". As the boat caught on, five more boats were built over the next winter in Mrs. E.W.J. Hunn's cellar at 300 Howard St., under the supervision of Mr. Merrill. The new owners were Bill and Herb Parsons "TOMATER", Bert Shoemaker "COBBLER", Tom Coe "GINGER", Ted Hunn "SNITHER", Lloyde Gladney "SPRINTIN SPLINTER". 40 Dusters were built over the next 10 years. Duster fleet # 1 was chartered, Knute Hunn was the first fleet captain. 1946 September 7th - 8th. The 1st Duster National Championship was held at Riverton Yacht Club. John Knight was the first national champion with Barbara Lippincott as crew. 1947 September 6th - 7th. The 2nd Duster National Championship was help at Riverton Yacht Club. The winners again were John Knight skipper with Barb Lippincott crew. The Duster became closely associated with the Lippincott family, the famous boat building family out of Riverton N.J. Brothers Bob and Howard Lippincott built world-class wood Stars, Lightnings and Comets with Bob winning the 1950 Star World Championship. I learned all of this because, in a twist of fate, Barb Martin, whose mother was a Lippincott, decided to attend Miami of Ohio University just shortly after Kurt Finnie and I had formed the sailing team. Barb immediately became the lynchpin of our heretofore non-existent Miami of Ohio's women's team, adding such rock-star racing ability that we qualified out of the Midwest for the Women's Collegiate Nationals (our other skipper, now Sue Ronshagen, being a converted crew). All Lippincott children were brought up sailing Dusters, there was a bunch of them spread out over several families. 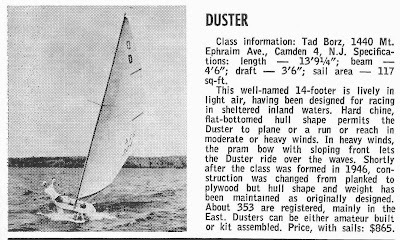 It came about in the summer of 1971 (if my memory serves, which it sometimes doesn't) there was an extra Duster available for their nationals held at some lake in northern New Jersey - I assume this lake was somewhere near Tillerman's old stomping grounds for his Sunfish sailing. Barb Martin gave me a call offering me the Duster and I jumped at the chance. The two day nationals turned into a drift-fest. I never got out of the leeward bilge, sailing the whole weekend tilted onto the leeward chine to reduce wetted surface. My memories of the weekend, though considerably faded, were of a great time. I got to meet many of the Lippincott clan, though again, the faces and names are now gone. My impression was they were very down-to-earth, just as you would expect from a boat building family. My thoughts of the Duster as a sailboat? I always wondered what a Duster would be like to sail in a breeze. The mast is not too far from the bow, the mainsail is huge; I wonder if you would have to hike off the stern when going downwind in a breeze. Certainly with that flat bottom, the planing performance would be a blast. If one was looking to build a nice sailing dinghy for the lake one couldn't go very wrong with the Duster. Good light air performance, nice long cockpit to hold two comfortably, three in a squeeze. The added freeboard compared to a Laser or Sunfish makes the Duster more of a sit in rather than a sit on small dinghy. I think plans are available. In another twist of fate, the father of one of my daughter's good college friends owned two Dusters. The Duster it seemed hadn't completely disappeared, chased into history by the Laser (as had happened to many of the U.S singlehanded classes around during the 1960's). The class has now collected itself at Lake Naomi, an exclusive resort community in the Poconos. According to this father, the "Duster Nationals" are still held every August on Lake Naomi. Two pictures of Dusters sailing on Lake Naomi. A photo of a start in the 1948 Duster Nationals.